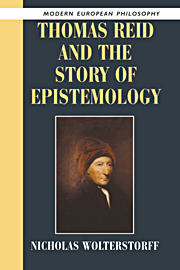 In Thomas Reid and the Story of Epistemology Nicholas Wolterstorff offers a detailed analysis of the epistemology of Thomas Reid, the famous Scottish Enlightenment philosopher, against the backdrop of his own context and modern epistemological theory. In it he seeks to explain why Reid has so often been misunderstood and neglected by philosophers and what it is that lies at the heart of his epistemology. In chapter 1 Wolterstorff seeks to provide an entry into Reid’s thought through the questions which were of most importance to him. He contends that Reid has suffered through too much focus on his theory of common sense. While Wolterstorff does not dispute the importance of common sense in Reid’s philosophy, he argues that if we begin here we shall never understand the true depths of his thought. Instead, Wolterstorff argues the two questions which were of most importance to Reid throughout his life were the following: What accounts for the fact that we are able to get entities in mind, in particular nonmental entities, in such a manner that we can form beliefs and other modes of thought about them? And, what accounts for the fact that we often do not merely entertain thoughts about these entities but also beliefs? As Wolterstorff suggests, Reid himself framed these questions in terms of predicative and not propositional description, that is to say, his concern is with predicating beliefs about particular entities and not with abstract propositions. Central to him was therefore the issue of what brings it about that we have things in mind in such a way that we can form predicative thoughts about them. Here, Wolterstorff suggests, three different options were available to Reid: conceptual apprehension, which is when we bring things to mind by means of a singular concept; nominative apprehension, which is when we apprehend something by means of its name rather than a concept; and apprehension by acquaintance, which occurs, for example, when we apprehend introspective states. The difficulty in interpreting his thought is the question of which of these he favoured. Opposed to Reid’s epistemology was what he called the ‘Way of Ideas’ and because this is so central to understanding his thought Wolterstorff devotes the whole of chapter 2 to discussion of it. In essence the Way of Ideas attempted to explain our acquaintance with extramental objects indirectly. More specifically, they explained knowledge of external reality through the mediation of mental images which they called ideas. Thus, to use Hume’s famous example, we do not see the sun directly but rather we see an idea of the sun from which we infer the sun’s presence and its characteristics. According to the Way of Ideas, therefore, all our knowledge derives from these ideas and it is only by reflecting on them that we are able to gain any beliefs about the outside world. As Wolterstorff outlines, Reid believed that thinkers such as Locke and Hume were led to espouse this kind of epistemology through their philosophical presuppositions about causation. Since they held that there can be no action at a distance they had to explain the mind’s acquaintance with external objects by something which was spatially contiguous to the mind – its own ideas. According to their view the immediate cause of perception and its immediate object must therefore be an internal image of the sort that represents the object and evokes acquaintance with itself. In chapters 3 and 4 Wolterstorff offers Reid’s two principal objections to the Way of Ideas. His first objection was that nothing was explained by recourse to these ideas. For Reid held that however clever their causal account of perception they were still confronted with the inexplicable problem of how a physical sensation could cause a mental apprehension. To demonstrate this fatal flaw in their theory Reid posed the question to them of why it is that the sensations of touch do not give rise to smell, or those of smell to hearing, knowing full well that they could not offer any explanation beyond the will of God. As Wolterstorff suggests, Reid’s point was not that he himself had an explanation for how such apprehension could occur, for in fact he believed that he had no explanation beyond the original constitution of our nature and the will of God, but that the Way of Ideas theorists emphatically did not. His second objection concerned the representative function of these ideas. As Wolterstorff expresses it succinctly his argument was that such ideas could not possibly represent objects because they bear no resemblance to them whatsoever. According to Reid, exclusive focus on visual perception and mental images had deceived philosophers into thinking that apprehension must work by reflection. To expose this deception he offered the counterexample of touch, arguing that our sensation of touch in no way resembles the hardness of the object that we touch. Going to the heart of their theory, Reid therefore disputed their claim that from the nature of pressure sensations the mind logically inferred the quality of hardness in an object. Since he held that they could be based neither on logical necessities since God could have constituted our nature differently, nor knowledge of correlations since this relies on the knowledge of a first correlation which is the very question at issue, he repudiated the inference account entirely. In chapter 5, which is the heart of the book, Wolterstorff offers a discussion of Reid’s analysis of perception. At the heart of this he argues was the notion of objectivation – ‘the formation of an immediate belief, about some item in one’s environment, that it exists as an external object’. While Wolterstorff concedes that Reid was somewhat hazy on the precise connection between sensation and perception, he argues that what is most important and original is Reid’s understanding of sensation as signs of external objects. For in holding that sensations functioned, through the mysterious constitution of human nature by God, simply as signs, he was under no obligation to hold that they resembled their object in any way. In holding that beliefs were immediate and not formed through resemblance he clearly demarcated his own position from that of the Way of Ideas. At its heart, then, Reid’s theory of perception concerns the interpretation of the immediate signification of sensations. While this might leave some tricky questions about illusory phenomena or hallucinations, Wolterstorff contends that it is a powerful explanation of our day-to-day experience of perception. In chapter 6 Wolterstorff turns to the objection that in postulating sensations as signs of objects Reid is simply tacitly returning to the kind of mediation theories which characterised the Way of Ideas. This, he says, is related to the vexed question, never satisfactorily answered by Reid, of whether we have acquaintance with external objects through presentational or conceptual apprehension. Wolterstorff himself takes Reid as arguing that we have immediate apprehension of external objects through conceptual apprehension. His argument for this is complex but relies on Reid’s distinction between our perception of visible figure, which he held exceptionally to occur without an intervening sensation, and our perception of real figure by touch. Since Reid’s distinction implies that it is only in apprehending visible figure that we gain direct acquaintance with a quality, it follows that most of our knowledge of external objects is by means of conceptual apprehension. Yet while Reid held concepts to structure our knowledge of the world, he still insisted that this knowledge was direct and immediate and it is this which, Wolterstorff argues, distinguishes him from the Way of Ideas. In chapter 7 Wolterstorff turns to Reid’s epistemology of testimony. As he outlines, the same scheme of sign and signified is crucial to Reid’s understanding of testimony. Reid held that particular features of the countenance or inflections of the voice functioned as ‘natural signs’. Thus when we see a particular facial expression we immediately, without discursive reasoning, recognise a particular mental or emotional state. Significantly, Reid held that there was an important analogy between this language of natural signs and the artificial language of human speech. This consisted in the fact that our speech also functions as a sign, albeit a much more complex sign, of what the utterer actually believes. According to Reid our natures are constituted by God, first so that our utterances are generally a reliable sign of what we believe (the principle of veracity), and second so that other people hearing our utterances will actually believe them (the principle of credulity). For Reid our analysis of testimony consists in the interaction of these two innate principles of veracity and credulity with processes of reason and induction. In this way testimony is in some way analogous to acquired perception, for in both we learn to associate various signs with definite beliefs. In chapter 8 Wolterstorff turns to give an account of Reid’s rebuttal of scepticism. From his works it is clear that Reid understands a sceptic in Cartesian fashion as someone who admits the existence of thoughts and sensations but insists that the existence of the external world, and indeed everything else, must be made evident by the light of reason. As Wolterstorff suggests Reid’s sceptic is therefore an example of a classically modern foundationalist. He is someone who holds that all beliefs must be founded on intuitive acquaintance or the deliberations of reason. Reid held that while such a position is not unworthy of a philosopher it is also doomed to failure. For since on his view our beliefs are carried along by our perceptions irresistibly, any attempt to doubt universally will be utterly futile. Moreover, he insists that such scepticism is also arbitrarily discriminatory, for while it wishes to adjudicate everything else by the standards of introspection and reason it has nothing by which it may adjudicate introspection and reason themselves. Indeed, Reid was insistent that both reason and especially introspection could seriously mislead us. To attempt to use reason to justify our beliefs is thus like attempting to lift oneself up by one’s own bootstraps – utterly futile. As Wolterstorff suggests what is so striking about this discussion is Reid’s antirationalism, his willingness to take perception and reason entirely on trust even when no grounds for this trust can be offered which are not themselves viciously circular. For Wolterstorff it is this stance of trust, of acceptance of the mystery of reality, which distinguishes Reid from so many other philosophers. In chapter 9 Wolterstorff turns finally to Reid’s discussion of common sense. This, he suggests, is best understood not as an aspect of Reid’s philosophy but rather of his meta-philosophy – his philosophy of philosophy. In particular it elucidates the stance of ‘taking on trust’ which was so fundamental to Reid. For Reid common sense is defined simply as that branch of reason by which we judge of things that are self-evident. Yet as Wolterstorff suggests, his discussion of common sense reveals an unhelpful ambiguity, for sometimes Reid will assume that common sense refers to self-evident principles and sometimes that it refers to things that everyone takes for granted. Moreover, Wolterstorff is insistent that these two strands of his thought are not entirely compatible. His solution is to suggest that Reid’s primary understanding of common sense is simply that of all things which we take for granted, and then to focus on this. According to Reid the major characteristics of principles of common sense understood this way are (i) that we do no hold them for any reason, (ii) that what is contrary to them is absurd, (ii) that we are under a necessity of taking them for granted and (iv) that they are grounded in the constitution of our nature. To illustrate the significance of these points Wolterstorff turns to an illuminating comparison between Reid’s view of common sense and Wittgenstein’s discussion of our shared world picture. Like Reid, but in an even more thoroughgoing manner Wittgenstein insisted that there are things that we all take for granted. These, he suggested, were the beliefs which are most deeply entrenched in us and as a shared world picture form the scaffolding which all of our other distinctive beliefs are attached to. Furthermore, he argued that those beliefs which are most deeply entrenched are exempt from doubt; this is because to doubt these deep beliefs we would have to doubt everything else which is just not possible. According to Wolterstorff, Wittgenstein’s entrenched beliefs which are impossible to doubt are precisely what Reid would call principles of common sense. Yet while Wittgenstein held these principles to be in some sense ungrounded, Reid was insistent that they are rooted in us because of a shared common nature which was instituted by God. Simply stated, Reid’s doctrine of common sense is just that ‘we are so constituted as to take for granted the reliability of our belief-forming faculties’. While, for Reid at least, common sense is not strictly central to the philosophical task, it exists always as its indispensable background. Wolterstorff closes his account of Reid’s epistemology with another comparison, this time with Aquinas. He notes that between Aquinas and Reid we find a clear inversion. Thus while Aquinas held that the highest wisdom lay in contemplation (specifically of God) Reid argued that it lay in practical action. Wolterstorff suggests that this indicates a fundamental clash of mentalities, or as he puts it of ‘epistemological pieties’. For Reid, contrary to Aquinas, holds that all we know is the reliance of all things upon God, beyond that we are ‘left in darkness’. It is this willingness to embrace the darkness, the underlying mystery of all things, in humility and gratitude which Wolterstorff identifies as Reid’s epistemological piety. At the heart of Reid’s system therefore is ‘ungrounded trust’ and this is what makes it at the same time so foreign and so compelling.